Sometimes it can difficult to gauge just how dirty your commercial property is until you get it professionally power washed. Springtime is officially here – how does your commercial property look in the extra light of day? If your property is still showing the signs of wear and tear left behind from a harsh winter, it may be time to invest in spring cleaning services. Atlantic Maintenance Group is here to fill you in on the benefits of power washing your commercial property. Power washing is a high quality method of cleaning that requires the use of a high-pressure mechanical sprayer. Power washing can effectively remove loose paint, mold, dirt, grime, soot, and most stains from the exterior surfaces on your commercial property. Power washing should be executed professionally to ensure ultimate safety and an effective clean. Trying to power wash your property without experience could result in injury or further damages. How is Power Washing Beneficial? When you own or manage a commercial property, the appearance of your building and surrounding areas is a reflection of your business. If dirt and grime has accumulated on the side of your building or on your walkways, the unfavorable appearance may deter potential clients from doing business with you. Additionally, the presence of life threatening contaminants like mold on your commercial property poses a health and safety hazard that should be rectified immediately. Power washing is beneficial because it can restore your concrete, wood, siding or other exterior surfaces to their original condition. By restoring the appearance and value of your commercial property, you are helping drive business and could make a lasting positive impression on potential clients and employees. When Should I Consider Power Washing? Power washing is extremely cost-effective for your commercial property. 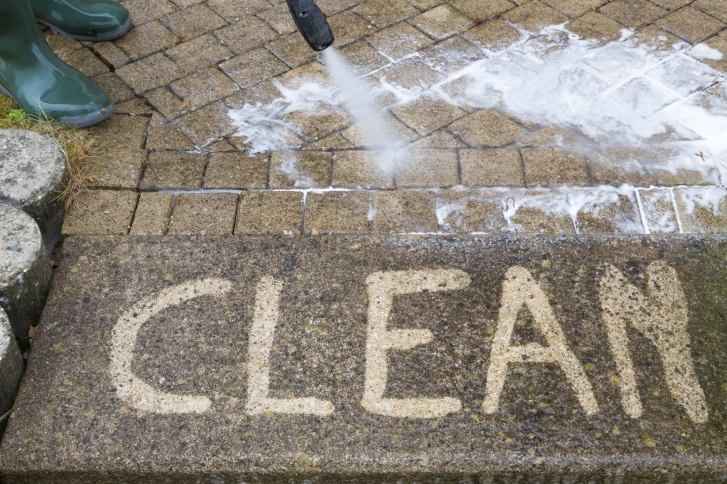 When you hire a power washing contractor and schedule routine pressure washings, you can rest assured that your commercial property will always look its best and meet health standards. Spring is a great time to consider power washing if you want to wash away the debris of the winter. This entry was posted on Wednesday, March 30th, 2016	at 8:36 pm	and is filed under Blog	. You can follow any responses to this entry through the RSS 2.0	feed. Both comments and pings are currently closed.